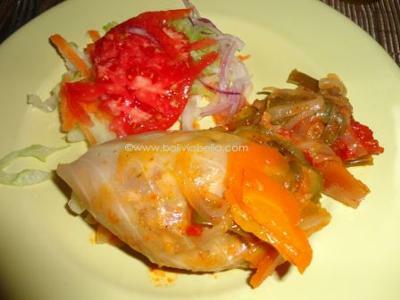 Stuffed cabbage is quite popular in Bolivia, although probably an imported recipe which has been adapted to the Bolivian palate. This recipe makes 6-8 medium-sized portions. Boil 2 cups of water. When boiling, pour in 1 cup white rice, reduce heat to low, and simmer until water has evaporated and rice is cooked. While your rice is cooking, fry 1/2 pound ground beef with no oil in one pan. Simultaneously, sautée onion, garlic, carrot and tomato in 1 tsp. oil in another pan. When the beef is fully cooked in its pan, and the carrots have softened and the onion has taken on a translucent (glassy) look in the other pan, add the latter to the beef, along with salt, cumin, and both ground peppers. Cook 5 minutes, stirring to mix thoroughly. By now your rice should be cooked. Remove it from the stove. In a large glass or metal mixing bowl, combine the beef and vegetables with the rice and mix completely. Cover so it won't cool too much. In a third pan, mix all the ingredients at once (notice there is no salt), and sautée with 1 tsp. of oil until the vegetables are cooked and soft. If your vegetables are too dry, add a bit of oil or water. Should take about 5-7 minutes. Simultaneously, steam your cabbage leaves for about 5-7 minutes, or until they are soft and become translucent. Drain and cool the cabbage leaves slightly, until you can handle them. Into each cabbage leaf, spoon an appropriate amount of beef and rice filling, sufficient to fill it, while still allowing you to wrap the cabbage around the filling, forming a "cocoon". Turn onto a plate, folded side down. Top with a spoonful of vegetable topping. Serve with a side salad. I'm always looking for creative ways to make what we eat more healthy. Try replacing 1 cup cooked rice with 1 cup cooked quinoa. Quinoa is packed with nutrients! Replace 1/2 pound ground beef with 1/2 pound lean ground turkey or chicken breast. Use cholesterol-free oil.